Dr. Cheng and Dr. DeFrank gave seminars at the 2017 Landscape Industry Council of Hawaii (LICH) annual conference and Tradeshow on October 5, 2017. Dr. Cheng presented a seminar on his latest research results on the management of several key landscape pests, including coconut rhinoceros beetle, lobate lac scale, and Ficus stem and leaf gall wasps, as well as his upcoming research project on the control of frit fly, a common turfgrass pest affecting multiple golf courses in Hawaii. 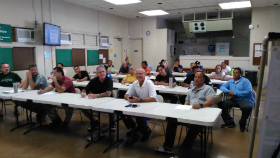 Over 50 people, including landscapers, arborists, HDOA staff, City and County of Honolulu staff, and CTAHR specialists and agent, attended this seminar, for which Continuing Education Unit (CEU) credit was offered. Students in Dr. Cheng's Turfgrass Pest Management class also attended the afternoon session of this conference as a part of their class field trip. Dr. DeFrank presented a seminar on weed control research including management of Bermudagrass and goose grass on Seashore paspalum turf. AJ Lindsey, TPSS M.S. student co-advised by Dr. DeFrank and Dr. Cheng, won 2nd place in the Graduate Student (M.Sc.) Poster Competition with his presentation entitled "Response of seashore paspalum (Paspalum vaginatum), Bermudagrass (Cynodon dactylon), and goosegrass (Eleusine indica) to post-emergence herbicides" at 2017 American Society for Horticultural Science (ASHS) annual conference, September 19-22, 2017, Waikoloa, HI. Congrats, AJ! Dr. Cheng attended the 13th International Turfgrass Research Conference (ITRC) in July 2017 in New Brunswick, NJ. One of the largest and most comprehensive gatherings of turfgrass professionals anywhere in the world, the 13th ITRC attracted approximately 500 participants from 26 countries. Dr. Cheng also represented Hawaii at 2017 WERA011 Western Regional Turfgrass Research Meeting at the same location prior to the 13th ITRC. Dr. Cheng and Dr. DeFrank gave seminars at the 2017 Crop Production Services (CPS) Annual Seminar and Tradeshow on May 12, 2017. Drs. DeFrank and Cheng, and AJ (M.S. student co-advised by Defrank and Cheng) presented research update on Bermudagrass and grassy weed control in Seashore Paspalum turf. Dr. Cheng presented another seminar on management options of several key landscape pests in Hawaii. Both presentations were well received by turf and landscape professionals state-wide. Dr. Cheng and Dr. DeFrank were invited to speak at the 2017 Department of Defense (DoD) pesticide applicator training on May 01, 2017. Dr. Cheng presented research-based results on emergent turfgrass pathogen control and environmental-friendly tree treatments. Dr. DeFrank presented a seminar on weed control and equipment calibration. 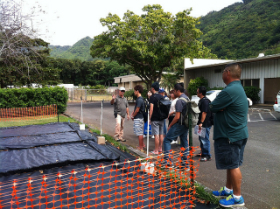 Pest management professionals from the Navy, Marine Corps, Army, and Hawaii Army National Guard attended this training program. Dr. Cheng and Mr. Norman Nagata (CTAHR Extension Agent on Maui) organized this half-day workshop for turf and landscape professionals in Maui County on March 30, 2017 in Kahului, HI. 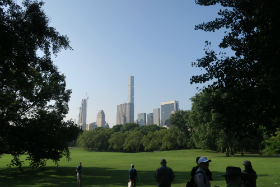 Dr. Cheng presented 2 seminars on various pests on golf courses and urban landscapes. Over 30 golf course managers and landscapers in Maui County attended, and 18 earned Pesticide CEUs. Attendees increased their knowledge on these pests discussed, and considered this workshop very informative and highly needed on Maui again in the future. Dr. Cheng gave lectures in 2017 UH Manoa Master Gardener programs on Big Island, Maui, Oahu, and Kauai. Dr. Cheng's 2.5-hour lecture covered common turf species in Hawaii, lawn/turf IPM, and importance of soil food webs and soil health in supporting turf health and quality. Post-class survey indicated participants' knowledge on lawn/turf management was significantly improved after training. Dr. Cheng and Dr. DeFrank were invited to speak at this CTAHR event featuring turfgrass and other commodities tailored for Hawaii's legislators. They discussed the significant contributions of turf sod production and turf/golf industry to Hawaii's economy, as well as current turf research projects and needs. The group then toured Southern Turf Hawaii sod farm in Mililani Ag Park. Fourteen attendees, including six senators and representatives, participated in this event. 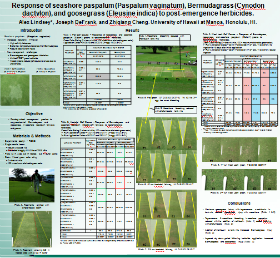 Dr. Cheng attended the 2016 National Turfgrass Entomology Workshop on August 21-23, 2016, in Sheboygan, WI, and presented state report for Hawaii. One day of this workshop was dedicated to the development of BMPs to protect polinators in turf settings. 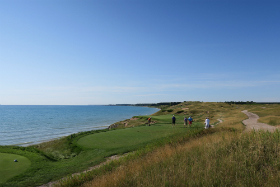 The group toured Whistling Straits Golf Course that hosted 2004, 2010 and 2015 PGA Championships. Dr. Cheng traveled to American Samoa for coconut rhinoceros beetle research on August 15-19, 2016. 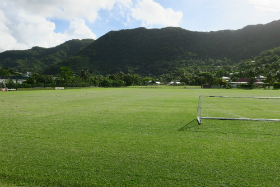 During this trip, Dr. Cheng visited two major turf facilities there: the FIFA Soccer facility/Field, and Ili'ili Golf Course, the only golf course on American Samoa. Dr. Cheng briefly discussed pest issues with turf maintenance teams at these two facilities. Dr. Cheng was invited to present a research seminar on landscape pest management and form collaboration with Chinese Academy of Tropical Agricultural Sciences (CATAS) in Hainan China during the first week of August 2016. 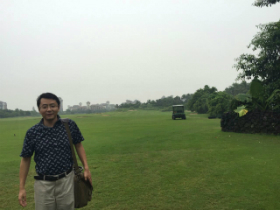 During this trip, Dr. Cheng visited Mission Hills Golf, a part of an integrated golf course, resort, and residential development in the suburb of Haikou, the captial city of Hainan Province. Being Hawaii's official representative for this regional group, Dr. Cheng hosted WERA011 Western Regional Turfgrass Research Meeting on July 24-27, 2016, in Honolulu. Seventeen turfgrass professors and scientists from 9 western states/territory attended this meeting. 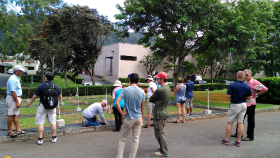 The group discussed turfgrass related research, extension and teaching within each state, and toured University of Hawaii at Manoa turfgrass research facility at Magoon research station and went on a field trip to a major turfgrass sod farm. 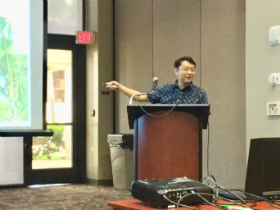 Dr. Cheng was invited by Mr. Richard Ebesu (CTAHR Extension Agent on Kauai) to give two seminars at the 2016 Kauai Landscape Conference on July 14, 2016. Dr. Cheng presented one seminar on turfgrass maintenance and pest management, and another seminar on management of recent invasive landscape pests in Hawaii. Responses from 27 attendees indicated that both seminars increased their knowledge on these topics by over 50%. Dr. Cheng was invited by Ms. Allison Wright, President of Maui Association of Landscape Professionals (MALP), to give a seminar on turfgrass and landscape pest management research update on 05/24/2016 on Maui. Dr. Cheng's seminar was well received by around 30 attendees on Maui, including green industry professionals, CTAHR extension agent, HDOA staff, and more. Environmental Science students from Nagasaki University toured the Magoon Research and Instructional Facility in March 2016. The students experienced a wide variety of projects, including our non-chemical turf renovation and weed control project (the "lights-out" project), demonstrated by Dr. DeFrank (pictured). 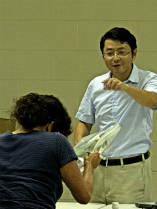 Dr. Cheng was invited to presented his research in the "Advances in Pest Management for Turfgrass and Ornamentals" Symposium in the 2015 Entomological Society of America (ESA) annual conference on November 15-18, 2015, in Minneapolis, MN. Dr. Cheng presented his research project on rover ant management at a golf course on Big Island. 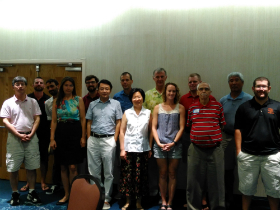 Being Hawaii's official representative for this regional group, Dr. Cheng attended WERA011 Western Regional Turfgrass Research Meeting hosted by University of Arizona on June 16-18, 2015, in Phoenix, AZ. 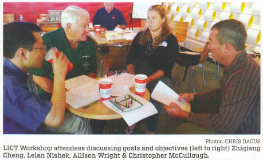 Around 12 turfgrass professors and scientists from western states/territory attended this meeting. 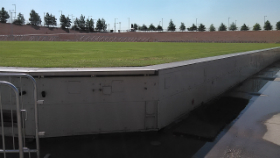 The group discussed turfgrass related research, extension and teaching within each state, and toured Arizona Cardinals' home stadium, one of the only 3 stadiums with movable field tray system in the world. On October 29, 2014, Drs. 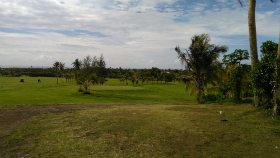 DeFrank and Cheng were invited to visit the NOAA facility on Ford Island to review the turf and landscaping management challenges there, especially on weed control. Suggestions were well received and appreciated by NOAA staff and the turf/landscaping maintenance contractor. Dr. Cheng was invited to present at the 2014 Hawaii Golf Course Superintendents Association annual seminar at Prince Hotel Waikiki on Oct. 3, 2014. In his seminar, Dr. Cheng provided management updates on invasive pests of turfgrass and landscape plants in Hawaii, such as brachymyrmex sp. (rover ant), little fire ant, Coconut rhinoceros beetle, banyan gall wasps, and lobate lac scale. Pesticide CEUs were offered. This is the premium annual educational event for golf course superintendents, managers, and professionals state-wide. Dr. Cheng was invited to present at the annual Hawaii Island Landscape Association Landscape Management Conference on Nov. 23, 2013. Dr. Cheng spoke on sustainable turfgrass management approach for Hawaii. This conference attracted over 200 turf and landscape professionals from Big Island, as well as from neighbor islands. Dr. Cheng was invited to start a brand new "Turf Column" for LICH's professional magazine "Landscape Hawaii". This popular magazine reaches thousands of professional readers in green industry in Hawaii as well as in U.S. mainland. The first "Turf Column" article will appear in 2013 July/August Issue. LICH held a statewide workshop on 06/15/2013 to determine the best direction to take the Landscape Industry Certified Technician (LICT) over the next years. In addition to LICH leaders and board members, Dr. Zhiqiang Cheng, Mr. Jay Deputy, Mr. Norman Nagata and Mr. Ty McDonald joined the conversation. Dr. Cheng joined CTAHR as an Assistant Extension Specialist (Turfgrass and Landscape Pest Management) on May 1, 2013. He obtained his Ph.D. degree (Environmental Science) from The Ohio State University (OSU), and worked in the Department of Entomology at OSU prior to joining University of Hawaii at Manoa. 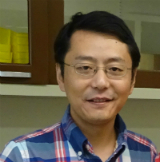 Dr. Cheng has over 10 years of research experience in the ecology and management of turfgrass and landscape pests, as well as soil ecology, and environmental bio-indicators. After one year service (2007-2008) at UH Manoa, Dr. Brosnan accepted a new position at the University of Tennessee beginning in August 2008. 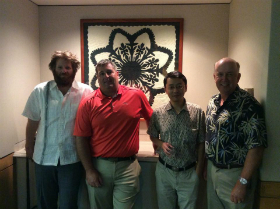 Dr. Brosnan, thank you for your contribution to CTAHR and turf industry in Hawaii! Copyright © 2007 Turfgrass Management at the University of Hawaii. All Rights Reserved. 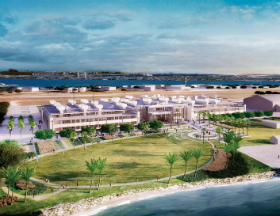 Site designed by Academic Web Pages.